Double gates with drop arches created for a customer in Rossall, FleetwoodBased in Fleetwood, Wyre Wrought Iron specialise in the creation of bespoke wrought iron gates, railings and more for homes, businesses and public buildings throughout the Fylde Coast and Over Wyre. 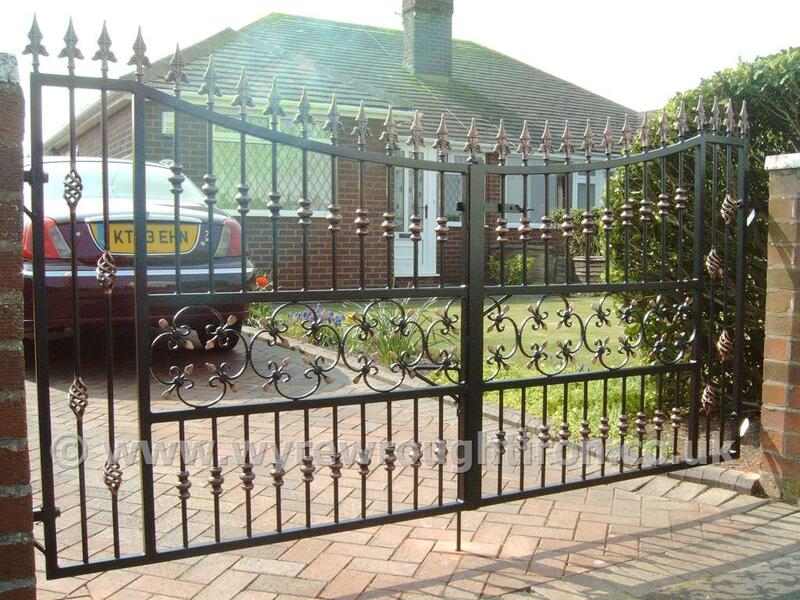 Gates - Quality handmade metal gates for gardens, driveways, business premises and more. 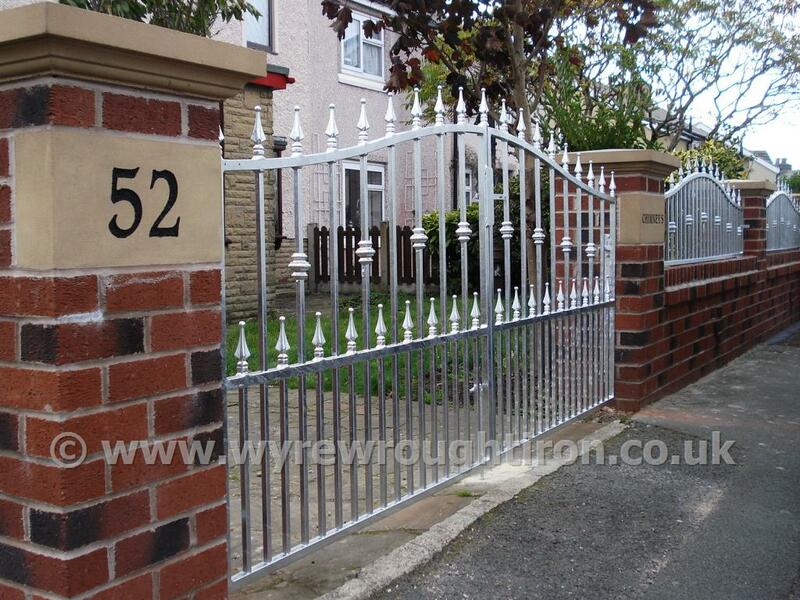 Plus, we also offer Refurbishment, Alterations, Extensions and Replication of existing gates. Railings - Our metal railings will improve the look of your property, whilst also helping to keep it secure. Steel Fabrications - From a single shelving bracket upwards, we can fabricate almost anything you can think of. Carports - A made to measure cheaper alternative to a garage created using low maintenance materials. Handrails and Balustrades - Ornate balustrades with decorative effects to functional handrails with safety features for a public building. Security Grilles / Fencing - Secure your property with made to measure, rust free, galvanised steel security features. Steel Sales - We can supply mild steel girders, sheet steel, flat bars and round bars of varied thickness, all cut to your required length. And More... - This website contains much of the commonly requested work Wyre Wrought Iron do, but we can do much more. If there is something you're after, but don't see it here, please give us a call to discuss your needs. We have over 25 years experience working within the ornamental ironwork and steel fabrication business and have built up a reputation for an attention to detail, customer satisfaction and a quality product at a reasonable price. Whatever the period of your home or type of premises you have, we have the necessary experience to create long lasting, secure and beautiful solutions. All our work is galvanised to BS EN ISO 1461 standards to prevent future rusting. An important consideration with the salt air on the Fylde Coast. The steel itself is galvanised by dipping it in molten zinc, meaning all parts of its surface are coated - inside, outside, awkward corners and narrow gaps which would be impossible to protect in any other way. Powder coating is a type of paint finish that is applied as a free flowing dry powder. The coating is applied electro statically and is then cured under heat to allow it to flow and form a "skin". It produces a high specification, hard wearing coating. For examples of our wrought iron work, please take a look at our Photo Gallery and Facebook pages.